I think I have made more stuff this summer than ever before. My schedule right now consists of waking up at 8, getting my room in order (making my bed, clearing off my craft tables, etc.) and eating breakfast, then sewing from 9-5 with a half-hour break for lunch around 1. Then I do fashion journaling from 5-8, eat dinner, and do whatever I want from about 8:45 to 11:30, then I go to bed. And what do I choose to do with my exactly two hours and forty-five minutes of free time? I make stuff. Usually, I crochet. 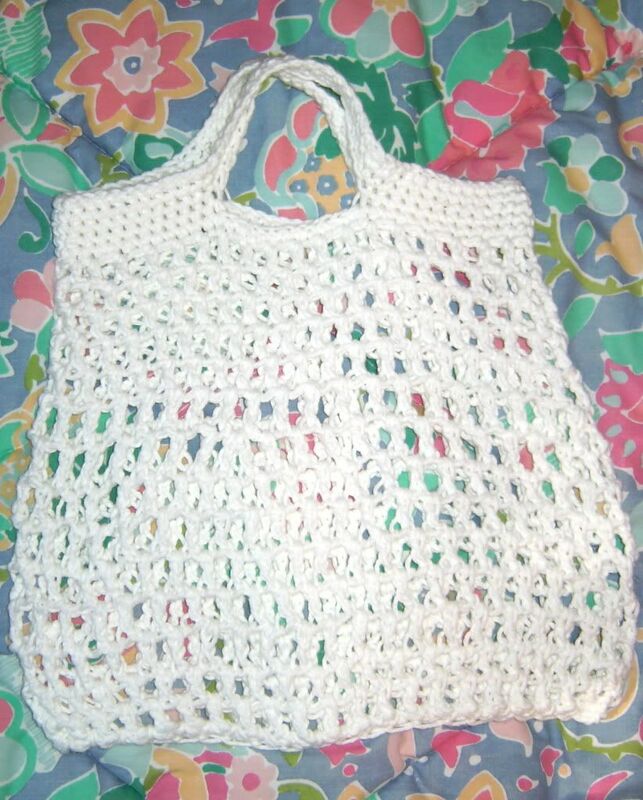 I recently finished two of these grocery bags, to use when I go back to school. 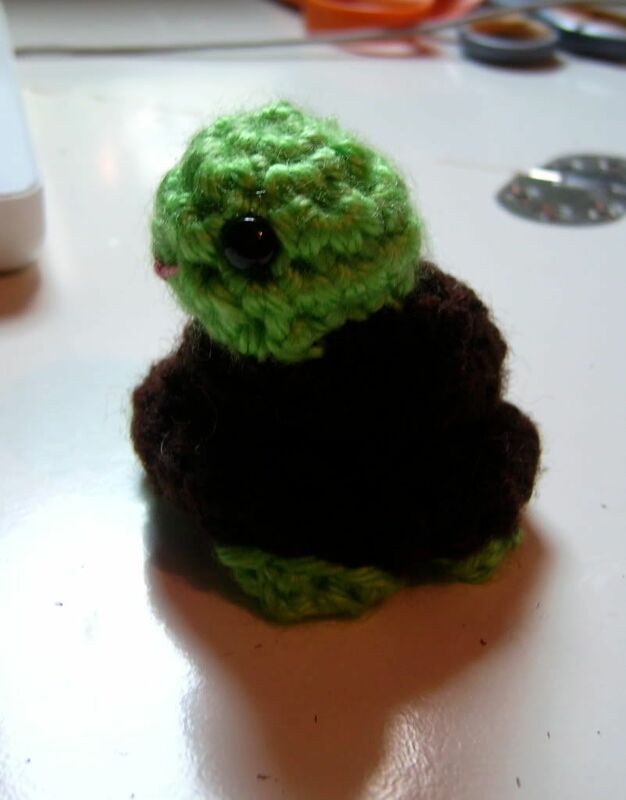 The pattern is from The Adventures of Cassie, a really neat blog. I found the pattern through Ravelry. I know it doesn't look that big, but after I'd finished my first bag, I tested it out, and put in two cans of spaghettios, two cans of cat food, a can of baby corn, a box of trash bags, and a cannister of oatmeal, and the bag wasn't nearly full. The pattern was easy to follow, too. I want to make another before I go back to school, and that should give me plenty of room to carry everything. Yay! 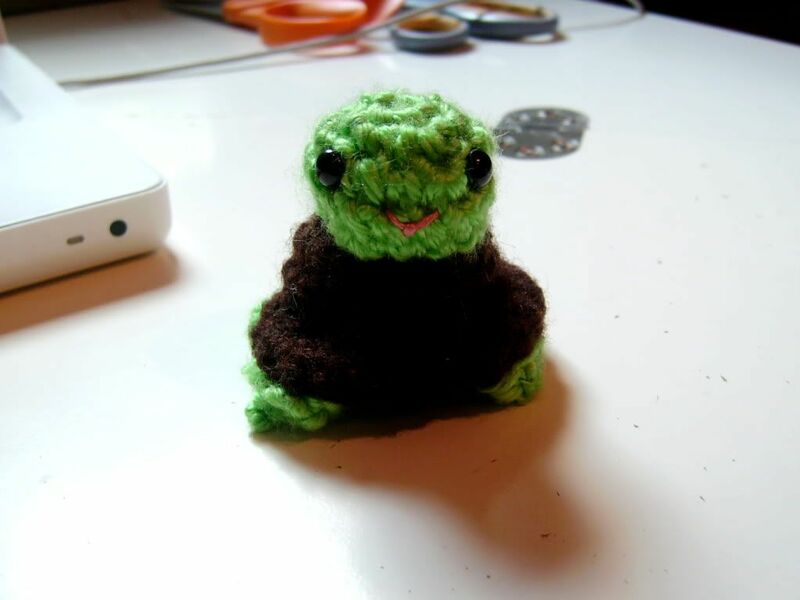 I also made a little turtle for my brother, from Ana Paula Rimoli's book, Amigurumi Two: Crocheted Toys for Me and You and Baby Too! I'm so happy with how it came out. I gave it to my brother today and he really liked it. 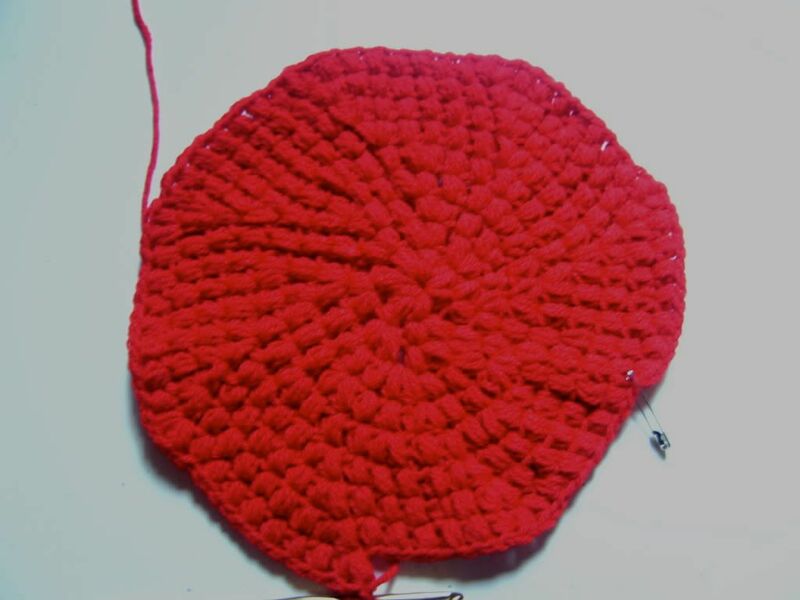 And, currently, (during my two hours and forty-five minutes of free time per day while watching Mary Tyler Moore on Hulu) I am working on a red beret with a bow. The pattern is by CreativeYarn, the same person who wrote the pattern for the three-strand headbands. Her patterns are so cute, I want to make as many of them as I can. I read in the comments to the pattern that some people have had problems with their berets coming out too big, but I wanted mine to be a little roomier than the one she shows, and I have kind of a big head and do my best to have big hair, I decided to go up one hook size, to an H. It looks, so far, like it will be just the right size and have just the right amount of floppiness. I also recently finished a Halloween costume I was commissioned to make, but I'm not going to post any pictures of that until the client says it's alright, because I don't know if he wants to keep it a surprise until Halloween. Either way.. suffice it to say that while sewing glitter dot fabric was irritating enough to make me crazy, the result is soooo gorgeous.... 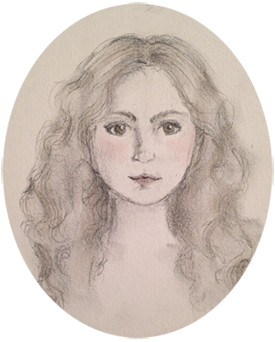 I'm thrilled with how it turned out, and I hope my client likes it just as much as I do. Lastly, a family friend was cleaning out some closets, and I ended up with three very neat things. 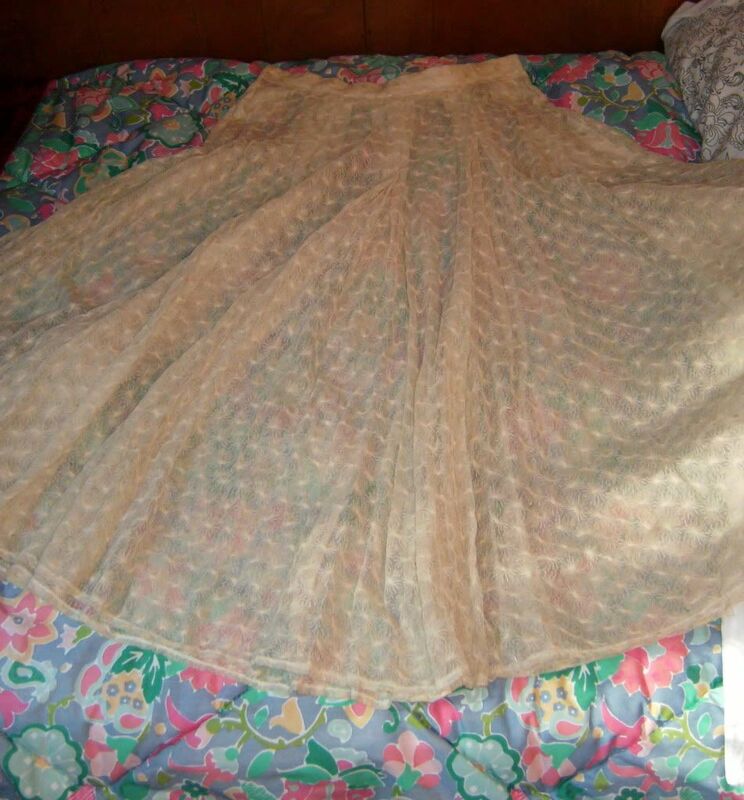 A long ivory lace skirt, which I'm not going to alter at all. However, I need to fiure out what I'm going to wear under it, because as it is now it's very sheer. 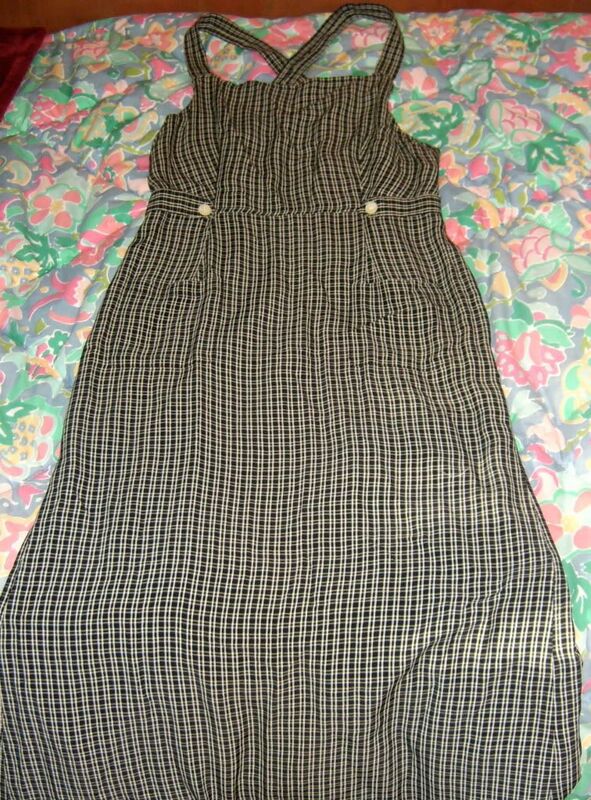 A long, green and beige plaid jumper dress. I'm going to shorten this quite a bit, and take the button tabs off the front, so that it's a cute dress to wear over tights. 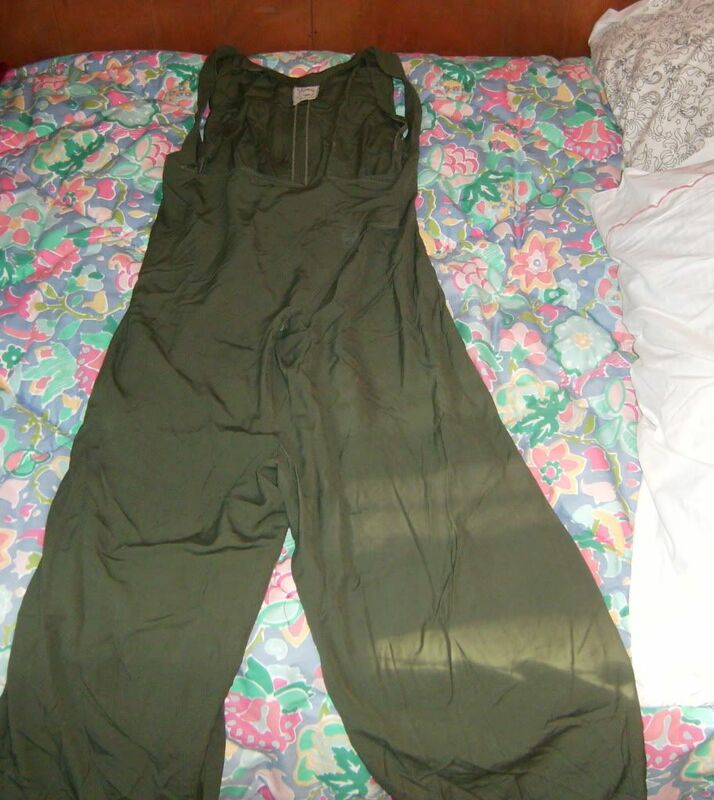 Third, a jumpsuit that ha a zipper up the front for about a foot, then has two strange flaps that would appear to cross over in the front, but which apparently have no way of staying closed. This is the more ambitious redesign. I'm going to take out the crotch seam of the pants and turn the bottom into a skirt, then add buttons along the side of the flap in the middle so that they stay closed. I need to make a thrift store run for crafting material for my dorm room... I need to find some pretty vintage plates and glasses. you are just too cute. i love the way you write exactly what your brain tends to spit out-i'm very much like that too. My summer is going really well... although admitedly, I'm excited to go to the beach in two weeks and not accomplish ANYTHING while I'm there. Ooooh, definitely give knitting and/or crocheting a shot! 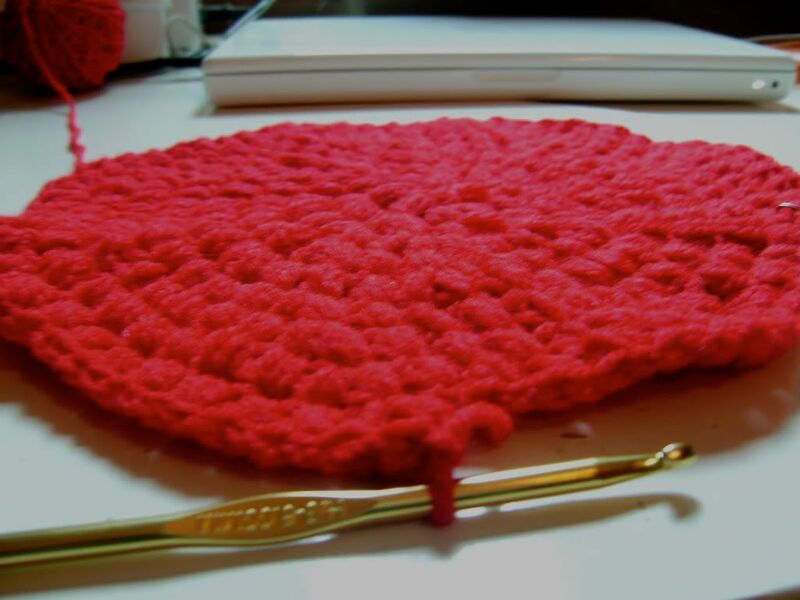 I know how to do both, but right now I'm really into crochet because it's faster for me and because I have a hard time knitting round things, but I can crochet them easily. Mmm, big chunky scarves are the best! And they're pretty fast to knit (or crochet) because it's big yarn on a big needle or hook. My grandmother taught me to knit, but I learned to crochet more or less completely by using online tutorials. So either one is definitely learn-able. I think I'm going to do two years in fashion, and then see what happens. I'm hoping to get into the art specialization program, in which case I probably wouldn't stay for the second two years of school if I can get a design job with an Associate's Degree. I've always loved writing-- it's definitely something I want to keep doing no matter what I'm doing as a profession. I've kept journals since sixth grade, but I started this blog because I realized that nobody was ever going to see those journals and therefore I was kind of wasting my time thinking up fun and witty things to write in them. I still keep a private one, but the vast majority of my stuff goes on here now. :) I love reading your blog! Even though I don't comment often. I'll try to do that more often. I loooooove the blog that you're using for your fashion 'rants'-- it's like having a letter from the editor every post. Imagine that you have just won an all expense trip to any city in the United States. Which of the many famous U.S. destination cities would you choose? New York, Las Vegas, Miami, or how about Boston or Chicago? Well, have you ever considered a trip down into the colorful history of the Deep South? Would you consider Atlanta, Georgia as a choice? If you check out Atlanta tourism sites, you might just be amazed at what the city of Atlanta has to offer.